The Globe reports the new owners of the massive Seaport Square land have Xed out longstanding plans for a park in the middle of the property and will instead give the BPDA plans for a walkway from Summer Street to the water that will be "narrower but longer, and friendlier to foot traffic." From the current plans on file with the BPDA: Read more. The Boston Business Journal talks to developer John Hynes about the three-building, 750-unit Seaport Square complex on which work is set to begin in mid-2016. The Boston Business Journal reports that owners of the Barking Crab won't go silently into that good night: They've submitted plans to replace their shack with a six-story building that could complicate plans for the gazillion-dollr Seaport Square project all around the restaurant. The developers of that project had proposed their own six-story building basically right atop the Krusty Krab Fort Point Channel establishment - and offered space in it to the Barking Crab. Gale International did all the "dirty" work, hosting at least six community meetings, modified all its plans, got everyone on board (including the BRA) and now the BC wants to come in and just build? Well, wouldn't you? John Keith posts an aerial view and a couple of maps of the 23-acre Seaport Square project next to and around the federal courthouse. Parking for massive South Boston project: More or less? 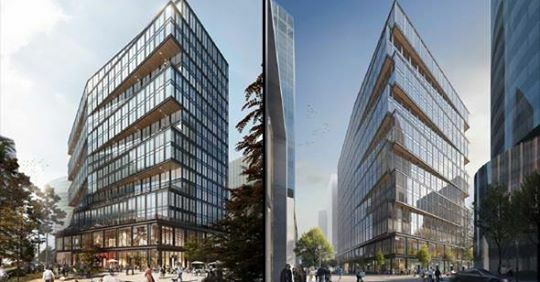 John Keith reports on a neighborhood meeting last night on the 6.5-million square foot Seaport Square project near the federal courthouse: I'm thinking he and Vivien Li of the Boston Harbor Association won't be sitting down for coffee anytime soon.